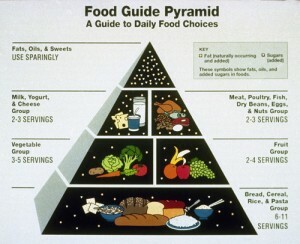 The official USDA food recommendations used to appear in the form of a so-called pyramid graphic, which adorned the walls of school rooms from coast to coast. Until 2011, when the pyramid was transformed into a graphical “plate,” the official government line was that grains should be the base of a healthy diet. The 2011 chart put vegetables in the top spot, with grains holding on in second place. Since the first USDA “food guide pyramid” appeared in 1992, it has been awash in controversy, particularly from medical experts and academics who said it was nothing more than a graphical representation of the U.S. government’s relationship with the commercial farming industry. And they were right. The original pyramid’s reliance on grains was the main sticking point for many experts, who pointed out that federal subsidy grants to grain-producing mega-farms was the only reason “grains, breads and pasta” were the primary recommendation on the government chart. Critics also focused on the fact that the food pyramid was constructed with policy, not science in mind. • Some health experts suggest that the bulk of daily calories should be comprised of healthful fats from sources like raw butter, nuts and avocados. When it comes to actual space on a plate, vegetables should take up the most real estate at mealtime, followed by proteins, fruits, grains, and sugars (in very small quantities). Some researchers go so far as to say that grains and sugars can be totally cut out of a healthy diet with no ill effects. This is a far cry from the “official” USDA MyPlate, which is heavy on grains. • The Harvard School of Public Health was so concerned with what they felt were inaccuracies in the USDA chart that they came up with their own set of recommendations based on decades of nutrition research, and not connected in any way with corporate farm subsidies. 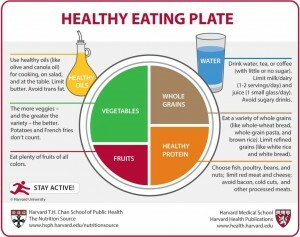 • Harvard’s “Healthy Eating Plate” suggests making about half of any meal vegetables and fruits, while noting that, for the purposes of healthy eating, “potatoes don’t count as vegetables.” The academic institution’s suggestion concerning grains is that they should comprise about one-fourth of a typical meal plate. The key point here is to consume whole grains rather than white, processed ones. • The government MyPlate chart says nothing about the quality of carbohydrates to be consumed; but vegetables, whole grains, beans and fruits tend to be the best sources for carbs, according to most nutritionists. • Perhaps one of the biggest controversies the USDA recommendations sparked was about fats, which are kept to a minimum on the MyPlate chart. Harvard’s alternative chart, and many other non-USDA sources, notes that healthy oils and fats should make up a large part of a day’s calories. • Organic and non-processed foods do not appear on the USDA MyPlate graphic. If one were to consume highly-processed meat laden with chemicals and stripped of all its most vital nutrients, the USDA would still refer to that food as “meat,” and count it as part of a healthy daily food regimen. When discussing meat and other animal products, one simply must bring in the question of quality. Organic meats and dairy that are not commercially produced tend to be the best choices. Antibiotics and a host of other unhealthy components show up in farm-factory poultry, fish and red meats. • Because the USDA recommendations in its MyPlate guide do not differentiate between the kinds of fat, and the sources of meat, the graphic is virtually worthless, offering no usable information for anyone who wants to eat right. The USDA has been involved with the business of corporate farming for decades. Whether that is a proper role or not for a government agency supported by tax dollars is another discussion for another day. What is relevant for health-conscious consumers, however, is the fact that the MyPlate recommendations are not based on reliable science and nutritional concepts but on politics. Anyone who wants to eat a healthy diet should look elsewhere for information about nutrition. Science-based resources on the Internet are a good place to start, as are many of the trusted medical websites that offer impartial information about food, nutrition and human health. Two were used when compiling some of the data in this article, but there are many more available.